Searching for that pot o' gold at the end of the rainbow? Our Shamrock Silhouette is a heavenly way to tip your cap to the luck of the Irish. 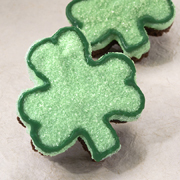 Our shamrocks feature our famous Simply Divine base dipped in fine white chocolate, sprinkled with emerald sanding sugar, then piped with tinted chocolate. Each Shamrock is hand wrapped in a cellophane bag and tied with a string of shamrocks. Decoration: Fine white chocolate, green sanding sugar, green candy writer (sugar, palm kernel oil, cocoa, non-fat dry milk, dry whole milk, glyceryl lacto eaters of fatty acid, salt, artificial coloring).